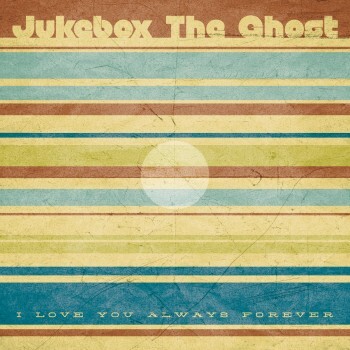 For Record Store Day 2012, Jukebox the Ghost released a 7″ for their cover version of the Donna Lewis hit, “I Love You Always Forever”. The record was inside of sleeves featuring hand drawn artwork from the band. This was a very limited edition release, which sold out quickly. Yep Roc is re-releasing the 7″, but this time it’s in a sleeve designed by a fan, who won a band sponsored design contest by Creative Allies. The 7″ is the same as the Record Store Day release, but the sleeve is different. It contains Jukebox the Ghost’s version of the Donna Lewis hit “I Love You Always Forever”, as well as a cover of New Order’s “Temptation”. To purchase this 7″ visit the Yep Roc Store HERE. Meanwhile, catch the band on tour with Motion City Soundtrack this fall. Look below for tour dates as well as the band’s Fall 2012 Tour Diary. Jukebox the Ghost announces tour with Motion City Soundtrack, 7″ cover design contest, and more.